This is the M-15 gas mask , which is the standard issue gas mask to the Israel Defense Forces. It features large triangular eye pieces for superior vision, a voicemeter for improved verbal communication capability, an upgraded exhalation valve for easier breathing, and a drinking tube assembly (not compatible with U.S. canteens). Shipped to <?xml:namespace prefix = st1 />U.S. addresses only. Very limited quantity. 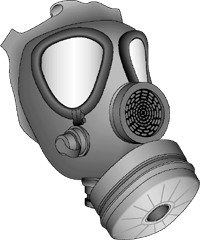 A Note on Sales of all Gas Masks: Gas masks offered for sale were manufactured to the full government specifications of the ordering government, and are in original, un-used condition.